Arguments about whether distinctive features of American society, culture, political structure, economic system, or population account for the relative weakness of American radicalism have engaged historians, sociologists, and political scientists for decades. Influential concepts such as frontier theory have been linked with the absence of class conflict in America. Other analysts have attributed the failure of the American Left to fierce repression, giving red scares and the McCarthy era as illustrations. Some have linked the American Left's failure to American immigration, winner-take-all elections, and the cultural values of individualism. 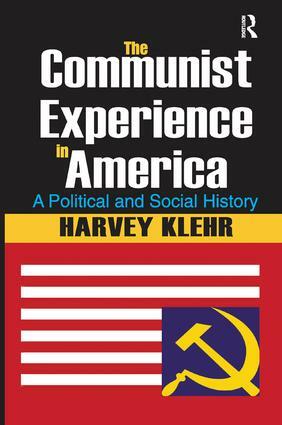 The Communist Party, one of America's largest and longest lasting radical groups, offers many lessons about how radical political groups can take advantage of-or squander-their opportunities.Klehr focuses on the theme of American exceptionalism and problems that America's capitalist society raised for Marxism and other radical groups. The Communist Experience in America deals with dissident communist formulations. Such groups included a number of talented men who went on to a variety of political and literary careers. Klehr also deals with fellow travelers, some of whom wrote fascinating essays on American exceptionalism and the decline of political extremism.In part, Klehr hopes to inspire the same moral outrage about Communism that fuels those dedicated to ensuring that Nazi crimes are never forgotten or obfuscated. Communism, in practice everywhere in the world, also came at enormous human cost. Regardless of their other virtues or qualities, those who supported or defended Communism from the safety of the United States must be called to account. This work does just that; in detail and depth. Moscow Gold: Confirmed at Last?